Pioneers in the industry, we offer Leather Infant Shoes, Infant Shoes, Baby Leaher Sandals, Children Wear Shoes and Kids Wear Shoes from India. Being a customer oriented company, we are into providing Leather Infant Shoes. 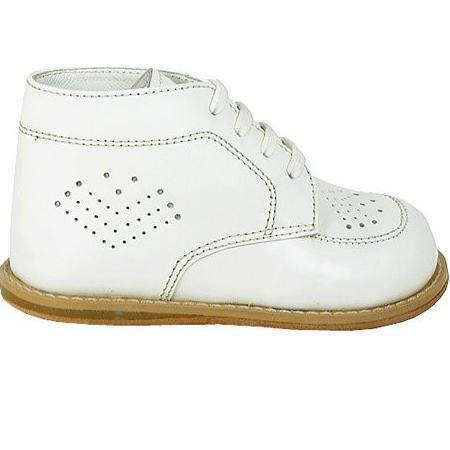 These Leather Infant Shoes are acknowledged by the customers for soft texture, optimum quality and many other features. Moreover, client can avail this product at reasonable prices from us. In order to keep pace with never ending demands of clients our company provides excellent quality range of Infant Shoes. These Infant Shoes are widely appreciated amongst clients for appealing patterns and impeccable quality. To attain the maximum satisfaction from our clients, we provide this product at market leading price. We are one of the well-distinguished companies in the market that is into presenting a quality approved range of Baby Shoes to our customers. These Baby Shoes are designed by trained cobblers with supreme quality raw material and sophisticated techniques. Furthermore, we provide this product after thorough inspection. Relying on our expertise in this domain, we are providing an extensive quality range of Children Wear Shoes to our customers. These Children Wear Shoes are widely appreciated by our customers for exceptional quality and flawless finish. Offered products are carefully inspected on numerous quality stages by quality inspectors. By: Miss & Litil Shoes India Pvt. Ltd.